I didn’t know whether the title was trying to tell me to expect another gardening theme, or whether it was trying to reassure me that it wasn’t. A read through of the preamble didn’t seem to indicate that any horticultural knowledge would be required so I guessed that I was on safe ground. Each clue contained a misprint and they would lead to a quotation with a part missing. The misprints could be anywhere in the clue, either definition or wordplay. Although such clues can be difficult sometimes, they can also be quite entertaining, and give the setter ample opportunity to deceive. I know from past experience that Hypnos’s puzzles can be quite tricky. Although he has set a number of EVs, Inquisiitors and Magpies, this is only Listener number two (the first being 4057 Inside with its porridge theme). 1ac was typical of the problems that were to be faced: They baffle revolutionary reserve holding line. The corrected misprint could be raffle, waffle, deserve, or indeed devolutionary … plus a whole host of possibiities like pine, lone, live and link. So I ignored 1ac for now and went on to 6ac which was likely to be horse depicter rather than Norse depicter, and that could only be STUBBS. I decided to linger in the top right corner for a bit, and 6dn STOWE and 8dn BROTH were soon slotted in. It’s always fun when the setter conceals a misprint in a word that forms part of an anagram, and 9dn was probably one such clue Transporting aid once ruined the boats. Here again, the corrected word could be one of many possibilities, although knowing that the answer began with B (from Stubbs) did reduce the options: I reckoned that boots and brats were the most likely. Of course, I was wrong. Getting 23ac VELCRO a bit later made BAT-HORSE look like it would be the answer, but it wasn’t in Chambers … at least, not under bat! For some reason I was assuming that both it and ‘batman’ were derived from the flying creature, rather than from a French word for packsaddle and therefore had their on entries. VELCRO was another entertaining clue, with the answer being hidden not in novel craft, but in novel croft. I found that what the corrected letters were spelling out took some unravelling, especially the second half. DRAT and BUT seemed to be lurking, but I decided that the last word was probably POPE. There was only one thing for it, and that was to look through all 11½ columns of Alexander Pope’s entry in the ODQ. Luckily I soon came across An Epistle to Dr Arbuthnot and “‘Satire or sense, alas! can Sporus feel? Who breaks a butterfly upon a wheel? '” Indeed, the corrected letters spelt out Who breaks upon a wheel with a butterfly missing. So where was the missing butterfly? According to the preamble, it was in the grid “in an appropriate form”, presumably that of either a butterfly or a wheel … or possibly a Rorschach ink blot! Despite guessing, correctly, that wheel was most likely, I failed to see anything obvious, probably because I was starting in the wrong place. I resorted to Chambers Crossword Dictionary. I’ve said before that I like the way this reference book lists words by length, and here I was looking for a 16-letter butterfly. Well it didn’t have any more than 15 letters. Hmmm. I sat back in my chair and pondered. Believe it or not, I pondered for about five minutes before I decided to consult Bradford’s! There I found three: Camberwell beauty, chequered skipper and tiger swallowtail. The Camberwell beauty was soon being highlighted in a wheel shape around the centre of the grid. Thanks to Hypnos for an enjoyable, if tricky, puzzle. 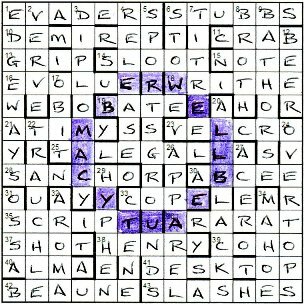 It took me about 3½ hours to finish the grid and a further 20 minutes to eventually find the butterfly. Just as last year had a fair number of science-based puzzles, I’m now wondering whether the editors are getting us ready for a year of horticultural themes! This entry was posted on 3 February 2012 at 5:00 pm	and is filed under Solving Blogs. You can follow any responses to this entry through the RSS 2.0 feed. You can leave a response, or trackback from your own site.